I got out of my (very dirty) SUV on Sunday morning to fill the gas tank. 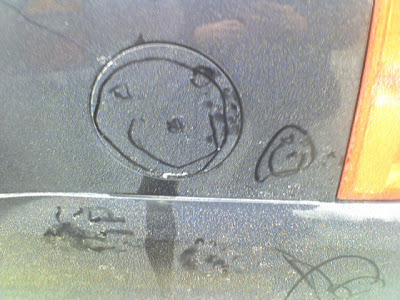 And I discovered the above-pictured artwork on my gas cap cover. I laughed out loud. And the coolest thing about my new custom look? I knew exactly which of my three-year-olds did it. He has a very distinct "happy face" technique. And this is it. I showed him the picture and asked him if he did it. "YES! I did it for YOU!"